Taking bus from Klang to Segamat is the favourite transportation option among the locals. 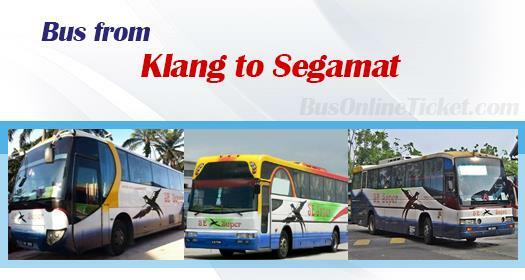 Locals especially working adults and students prefer to take direct bus from Klang to Segamat because there is no direct train service from Klang to Segamat. SE Super Express is the one and only bus operator which offer bus service from Klang to Segamat. SE Super Express is one of the well-known bus company based in Klang. SE Super Express only provides 2 daily trips for this route. The first bus service is in the morning 9am and the second or the last bus service leave the Terminal Klang Sentral in the afternoon 2pm. The duration required for bus from Klang to Segamat is about 4 hours depending on traffic and climate conditions. Because of long hour journey, SE Super Express operates this route with VIP coach equipped with spacious seating layout. The bus fare for this route is RM 23.50 for adult and RM 19.00 for child. At least one washroom break will be provided during the journey. The pickup point in Klang is located at Terminal Klang Sentral, Counter 21. Terminal Klang Sentral is a modern transportation hub located at Jalan Meru. The drop off point in Segamat is located at Segamat Bus Terminal. Segamat Bus Terminal is located at the town centre and diagonally opposite to Segamat KTM train station. Passengers who want to take bus from Klang to Segamat are advised to book bus ticket online because of the limited trips available from Klang to Segamat. You can book your bus ticket online now from our official website BusOnlineTicket.com or via mobile app which can be downloaded for free on App Store or Google Play just a fingertip away.